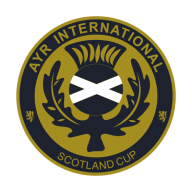 As well as our beautiful host town of Ayr, teams visiting Scotland may wish to take the opportunity to visit Glasgow and Edinburgh. In Glasgow you may wish to visit three of Europe's top Stadiums:- Hampden Park, Ibrox Stadium and Celtic Park, or shop in the magnificent City centre. Whilst in Edinburgh you have the opportunity of visiting the historic Edinburgh Castle and shopping in Princes Street and the Royal Mile. AYR: Ayr is a large town on the west coast of Ayrshire in Scotland, United Kingdom. Ayr is currently the most populated settlement in Ayrshire and is the 12th most populous settlement in Scotland. The town adjoins the smaller town of Prestwick to the north, forming a single continuous urban area with the town. What to do in AYR? GLASGOW: Glasgow is a port city on the River Clyde in Scotland's western Lowlands. It's famed for its Victorian and art nouveau architecture, a rich legacy of the city's 18th–20th-century prosperity due to trade and shipbuilding. Today it's a national cultural hub, home to institutions including the Scottish Opera, Scottish Ballet and National Theatre of Scotland, as well as the National Football Stadium and a thriving music scene. What to see in Glasgow? Edinburgh: Edinburgh is Scotland's compact, hilly capital. It has a medieval Old Town and elegant Georgian New Town with gardens and neoclassical buildings. Looming over the city is Edinburgh Castle, home to Scotland’s crown jewels and the Stone of Destiny, used in the coronation of Scottish rulers. Arthur’s Seat is an imposing peak in Holyrood Park with sweeping views, and Calton Hill is topped with monuments and memorials.